I am on some sort of creative roll lately. Here’s the latest project I’ve finished, a baby quilt commissioned by a woman at one of my employer’s customers for her great niece. In what I think may be some kind of record for me, it went from vague idea to finished quilt in a little less than one week. Of course, during that week, I did very little else besides work at my job and work on this quilt, but I’m still a bit surprised I was able to do it. The rush was due to a date for the baby shower being set; the woman paying for the quilt said it was no problem at all to get the quilt later, but I wanted her to have it for the party, which she now does. The only direction she gave me was “pastels”, so I had free reign when it came to design. I liked that, to be sure, though there’s always the worry that my choices might not suit her; in this case, they did—when she got the quilt, she said she loved it. Whew. I made this quilt entirely from fabrics I had in my stash. I started with a green print with elephants and birds and jack in the boxes on it; this was the same print but in a different colorway as the one I used as a main fabric in a quilt I made for the same woman’s first granddaughter several years back. I also had that print on ivory, so I pulled that out, too, along with more greens, some neutral tans, and a yellow companion print to the green and ivory. The color scheme the couple had chosen for the nursery was ivory and tan, so I didn’t have a lot to go on there. For a pattern, I leafed through the folder of baby quilt ideas I’ve got in my file cabinet and found one called “Railroad Ties” from the March/April 2003 issue of Quiltmaker magazine. 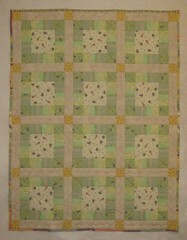 To make a baby-sized quilt, I had to use fewer blocks than the pattern called for, and I ended up adding sashing squares to the original pattern and not following the directions exactly on how wide to cut the strips so I could better use the prints I had. It went together quickly, obviously. For the back, I pieced two lengths of a companion stripe to the green print. I quilted it with a variegated cotton thread in pastels that coordinated with the prints and turned the back to the front instead of doing a separate binding (that saved some time). I added a label, and it was done. I hope this means I’ve got my quilting mojo back, because I’ve got plenty of projects I want to work on.